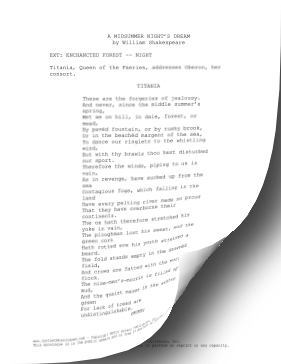 Middle-aged and older actresses can use Titania's dramatic monologue from William Shakespeare's romantic play, A Midsummer Night's Dream, for auditions. Titania, Queen of the Faeries, addresses Oberon, her consort. These are the forgeries of jealousy. And crows are fatted with the murrain flock. For lack of tread are undistinguishable. The human mortals want their winter here.